Development of nanocomposite thin films ((Ti,Al,Si)N) prepared by reactive magnetron sputtering. The main aim of the work is to produce hard coatings for use in cutting tools in order to increase its life time and reduce the friction, avoiding the use of lubricants and coolants, which are considered harmful for the environment. Incorporation of nanoestructures, such as nanoparticles produced by sol-gel and nanofibers produced by electrospinning in ceramic matrices in order to improve the mechanical and tribological properties. The main drawback of urethral stents is related to microbial colonization and consequent infection. Thus, the main objective of this work is to develop DLC coatings doped with Ag nanoparticles and Ag-Au alloy nanoparticles produced by plasma gas condensation and study the Ag ionization rate in biological medium. The main objective and innovation of the work is to study the effect of nanoparticles size and chemical composition on the Ag ionization rate and finally to develop a coating with controlled Ag ion release by tailoring both the DLC and Ag and Ag-Au nanoparticles size/morphology. 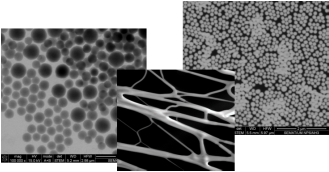 A poly (lactide-co-glycolide) and hydroxyapatite (PGLA/HA) composite are used to manufacture scaffolds using nanofibers produced by the electrospinning technique, so that it imitates the architecture of the native bone, allowing the cells proliferation and the regeneration of the bone. Research activity is focused on the development of new bioactive and functional coatings for Ti-base dental implants by chemically modifying their surface through the deposition of more bioactive Ta-based coatings by magnetron sputtering and inducing a multilevel porosity on the surface with resource to either the use of pre-processed microporous substrates or nano-patterning the top coatings by anodization process. TiAg and TiNAg coatings deposited by magnetron sputtering are proposed as electrodes for electroactive polymer. These coatings present multifunctional character since they are able to provide antibacterial activity, due to the presence of silver, which is presently pointed as the most efficient bactericidal agent and are biocompatible, offering also outstanding corrosion and wear resistance. These sensors allow to detect problems related with medical implants, allowing the health care providers to solve them at the begging, thus avoiding future complications which in ultimate scenario can lead to the implant rejection, with consequent human pain and high economical costs associated with the prosthesis replacement. Production and characterization of Me-CN-nAg coatings are being deposited by unbalanced magnetron sputtering with the purpose of improving the mechanical and tribological properties of joint orthopedic devices, providing corrosion and bacterial resistance. The segregation of silver to the coatings surface and its controlled released are being studied to control the Ag+ release to the environment during the orthopedic device lifetime, enhancing the bactericidal effect and the durability of the implant.